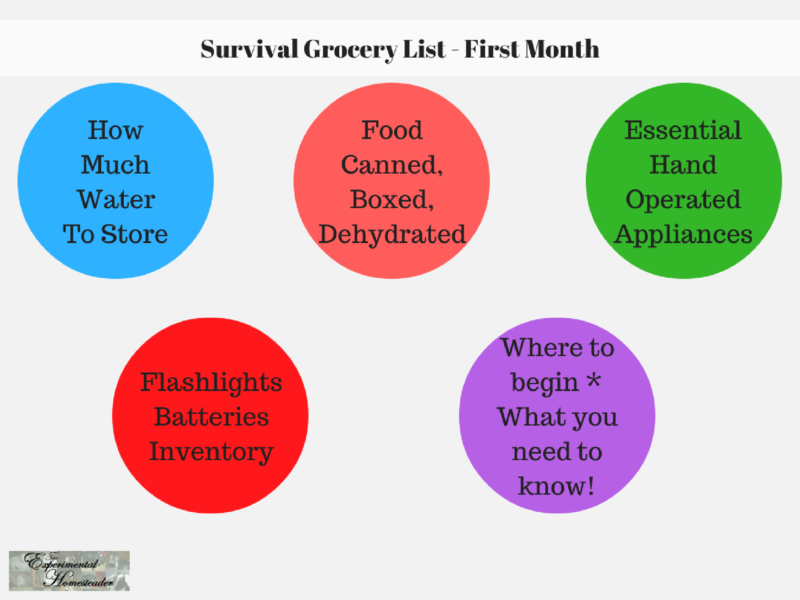 I came up with a basic survival grocery list – plus a few extra items so you know where to start stocking up for your first month. 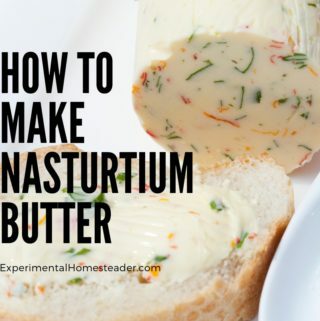 Feel free to take as long as necessary to add these items to your pantry or bug out bag. This is just meant to give you a starting point. Is Stocking Up Really Necessary? 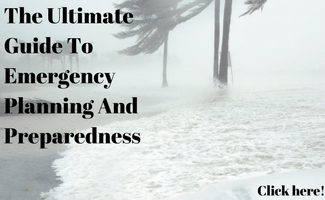 A lot of people wonder if prepping for some unknown disaster is really necessary. I believe it is – and even if that disaster doesn’t occur in our lifetime, prepping is still beneficial. Think of it as getting ahead and being prepared. When the weather forecasts a severe snowstorm or other natural disasters you won’t have to run to the store to stock up because your pantry is already full. No more trying to buy things the store is already sold out. No more crazy lines or watching people grab stuff just as you are getting ready to. Anyway you look at it, being prepared means less stress and less hassle when SHTF. Knowing where to start and what to buy can seem overwhelming. The sheer cost alone is why some people avoid any type of long-term prepping – but there are ways to get around that. Grow your own food and herbs. However, since this is the middle of November here in Indiana and very few people grow food during the winter – even though you can and I do – we will start the first month of prepping out by doing things that do not require you to be outside and buying items that are either on sale now or are items you may already be purchasing. Remember that even one extra box of band-aids can get you on your way to being prepared should the need arise so do not let budget contrasts stop you. Water is a great starting point – we all need it and storing it is something that just makes sense. Think about all the times your well or city water supply goes down. Now instead of doing without or running to the store to buy water you can have your own supply. I prefer to store water in glass mason jars. 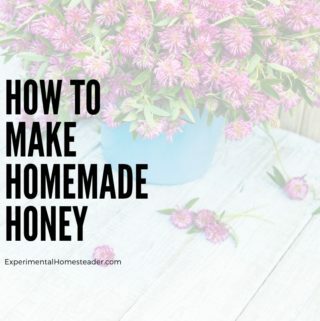 In fact, since I can, I have found a great way to stock up on water is to fill a canning jar to an inch from the top and seal it during the regular canning process. This way if I only have five jars to put in my canner, I can add two of water and fill the canner up. Some people put a drop of bleach in their canned water but if you live in town this is not necessary because your water is already treated with chlorine. I have not done this and wonder just how safe that is. 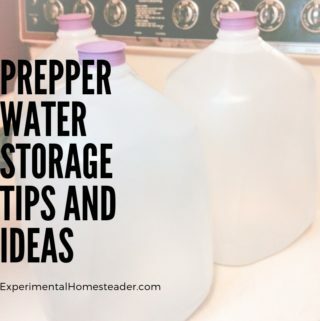 For those who do not can but want to store water, you can buy it in containers that range in size from 16 ounce bottles all the way up to 55-gallon drums. Another option is to fill plastic pop bottles, milk jugs or other sealable containers with water. Be sure the containers are clean before you fill them. Be sure to write the date on the container so you can rotate your inventory as necessary. The next thing you may be wondering is how much water should you store. Let’s start with 3 gallons of water per person. Add an additional 3 gallons of water per pet unless they are large animals such as cows or horses, then save about 5 gallons of water per pet. If you do this small amount of water every month, then at the end of a year, start using and replacing the water as needed you will end up with quite a supply that will get you and your pets through most disasters or unexpected situations. If this seems like a lot of water, well it is and if you don’t have enough room to store this much water, simply store what you can. The best place to store water is in a basement or other cool, dark area. Lastly, if you suspect your water was contaminated during the storage process, you can boil it before you use it. Remember that water is a living thing and so the naturally occurring oxygen in water may disappear during storage. Often simply stirring or swishing the water before you drink it is enough to add the oxygen back in and remove the funky taste. Canned, boxed or dehydrated food is an important consideration for any prepper. 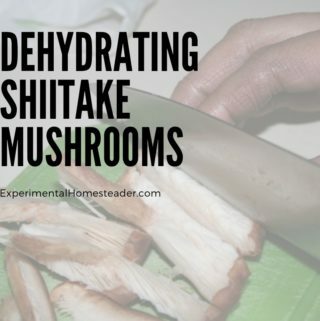 You can dehydrate and can food yourself or buy it – whichever you prefer. I have a combination of both in my pantry. Fruits, vegetables and meat are the three main items you will want but don’t forget about powdered eggs, butter, milk, and cheese. I buy the powdered eggs, butter, milk, and cheese because I do not feel it is safe to dehydrate my own. Prices on these products vary as do the sizes of the containers. However without electricity for refrigeration, these are items I would want and need to be able to make tasty, well-balanced meals for my family. Learning to can your own meat is a huge money saver. 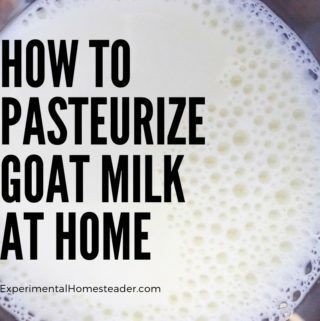 It allows you to hunt or raise your own livestock or even buy things on sale, then preserve it without a freezer. Now I admit using a freezer for meat is easier than canning it but take it from someone who lost an entire freezer of meat when they were away from home and a power outage occurred – the extra work necessary to can it will pay off sooner or later. Another option for meat storage is dry curing or dehydrating. I have made jerky but that is as far into meat dehydration as I have ventured. Thanksgiving is just a few weeks away so the morning of – or the day after – is a great time to stock up on fresh turkeys at a reduced price. We often buy large (think 20 pounds) organic turkeys on Thanksgiving morning for around $10 each. Many of us already grow our own fruits and vegetables. If you’ve been canning those, you are ahead of the game. 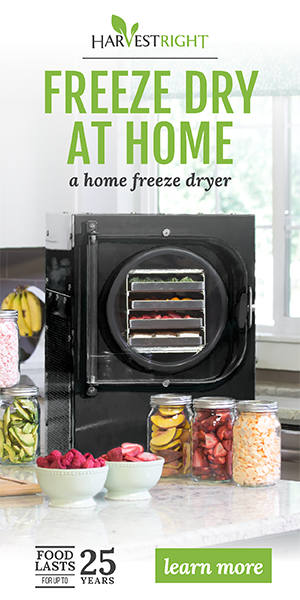 If you froze them, look into what you need to do to turn some of those frozen fruits or vegetables into canned foods. The holiday season is a great time to look for sales on fruit – both fresh and canned. Stock up now and don’t forget to go out the day after Thanksgiving or Christmas to see what canned or boxed foods you can buy at a reduced price. Yes, items that have holiday packaging can be bought for as much as 90% off the original retail price. 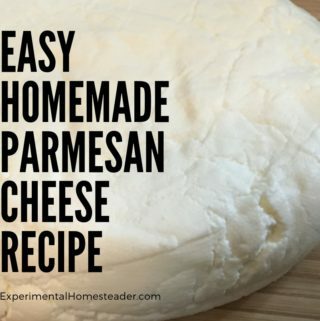 Anything that has flour or sugar in, put into a freezer bag and freeze it. Yes, I am serious. This kills off any bug eggs that may be in the food. It also keeps it safe from mice or other bugs that may get in your house. The plastic freezer bag keeps it dry should the electricity go off. If you don’t have enough freezer room for long-term storage, simply freeze the items as long as you can, then move them into a cabinet for longer-term storage. I typically remove items in boxes from the box and put them into glass jars. Again, this just keeps mice, moisture and other critters out. So how much canned, boxed or dehydrated food should you buy? Let’s start with 20 containers of each item – and no you do not need to buy this all at once. You go to the store and see canned vegetables 10 cans for $5. Go ahead and buy the 10 cans. If you can afford 20 cans, go for it, but if not, set three of those ten cans aside. This gives you enough canned vegetables to eat one can a day for a week – and you have three cans stored. If you bought twenty cans, set 13 cans aside. Now you may be thinking those cans were cheaper so why pay $2 a can now when I still have vegetables I could eat. This is logical thinking, yes, but if you never start setting food aside for the “what if’s” life throws our way, you never will. What you want to build up to is a 6 month to one year supply of food in your pantry. I have a one to two year supply in mine. Some things get eaten up quickly. I do rotate my food on a regular basis. I also keep a list of what I use up so I know I need to replace it. Look for sales and use coupons. Before you know it, your pantry will be stocked. Electrical appliances especially can openers are nice. I admit it but I no longer use them. I have an old-time bottle opener that was my Grandma’s along with several others I have picked up along the way. I also have a favorite hand-operated can opener and several not-s0-favorite backups just in case my favorite one breaks – and yes, they do break. I have a hand-operated grain grinder that grinds corn, wheat and other grains, herbs, etc. If the grid goes down, I can still grow and grind my own wheat and corn for bread, flour or cornmeal. I am learning how to use it now so I don’t panic should I ever need to use it. I found my grain grinder for $6 or $7 brand-new at our local thrift shop. Keep an eye out and ask around. Possibly someone you know has one that they don’t want. Keep an eye out for other non-electrical appliances. Finding room to store them might be hard right now but if that day ever comes when SHTF you are going to be glad you have them. Keep at least 2 battery or hand-crank operated flashlights. I personally have an arsenal. I buy rechargeable batteries and recently added a #sunlabzsolar13w portable, folding solar panel to the list. Yes, this solar panel only charges via USB cord, but hey there are USB flashlights or battery chargers you can buy. I also suggest buying a large flashlight and a small flashlight – think pocket size. Look into the hand-crank ones because some of those even have an emergency radio you can use. They don’t power up for a long time but you can keep cranking on them and at night that may be your only option if the batteries you are using go dead or your flashlights suddenly die. This last task does not require money – unless you have to buy a pad of paper to write your inventory list down on! Start making lists of your disaster supplies, camping gear, water inventory, food inventory (this is a great time to date and rotate what you have on hand), first aid supplies, blankets, firearms or other self-defense items, cooking methods such as solar ovens, fire pits, wood stoves or charcoal grills plus the fuel necessary to operate them and clothing such as hiking boots, coats and gloves. Add to your supplies over the next few months. Remember to shop end-of-season sales. Buy two instead of one and set one aside instead of putting it in the normal area it would go. A great way to store these extra items is inside 5-gallon buckets with lids. Mark the outside of the bucket with the contents and hang them from your basement or garage rafters. I hope this has given you a starting point for your first month prepping. Remember, it’s never too soon to start and once you do, you will be glad you did even if you don’t believe that things could go south in a heartbeat, natural disasters and snowstorms do occur all the time.